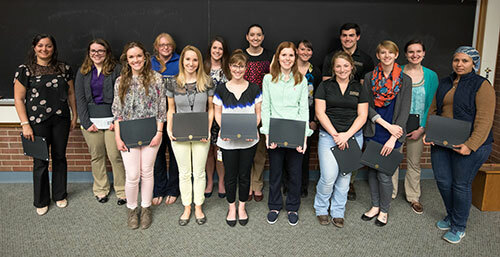 Purdue Veterinary Medicine faculty, postdoctoral fellows and students came together to highlight the latest research underway in the College of Veterinary Medicine at the PVM Research Day held Monday, April 10. Following introductory remarks from Dean Willie Reed, recipient of the 2016 Zoetis Award for Veterinary Research Excellence and Professor of Cardiology Dan Hogan kicked-off the day with the presentation titled, "My Thrombosis Journey… From Clot Cats to Fat Cats?" followed by parallel oral presentations focused on oncology, animal welfare/human-animal bond, and infectious diseases and immunology. Attendees took a mid-day break for the annual poster competition, which were judged by a panel of faculty. The afternoon sessions included presentations by Osborne Award competition finalists, the 2017 Phi Zeta Omicron Chapter Graduate Student Research Award presentation titled, "Contraction of Intestinal Effector T cells by Retinoic Acid-induced Purinergic Receptor P2X7" by Dr. Seika Hashimoto-Hill and presentations for the 2017 PVM Graduate Student Research Award and Phi Zeta Manuscript Awards for Basic Research and Clinical Research. Presentations concluded with the keynote lecture, "One Health — A Prescription for Preparedness" given by Dr. Jonna Mazet, executive director of The One Health Institute and professor of medicine and epidemiology at the University of California, Davis — College of Veterinary Medicine. Dr. Mazet's presentation focused on recent pandemics such as the Ebola and Zika virus and the importance of the One Health approach. 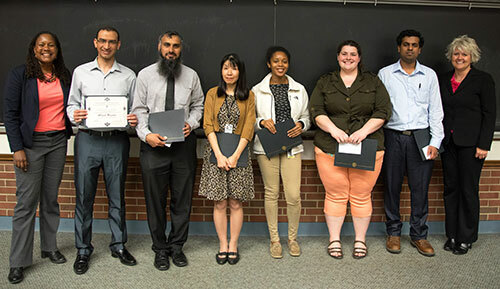 The event concluded with the formal presentation of research awards and prizes for the best poster presentations, and induction of new members to the Omicron Chapter of Phi Zeta. Click here to view a list of the award winners (PDF). 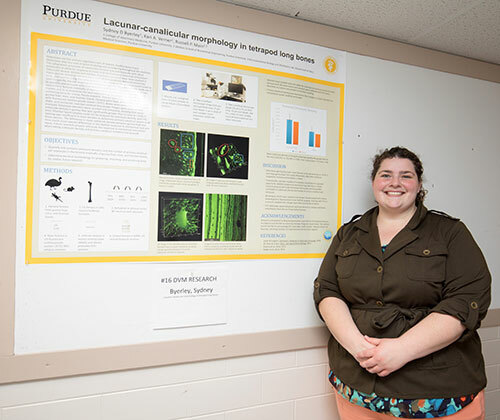 Sydney Byerley, of the DVM Class of 2019, with her award-winning poster in the DVM Research category at the 2017 PVM Research Day held Monday, April 10. 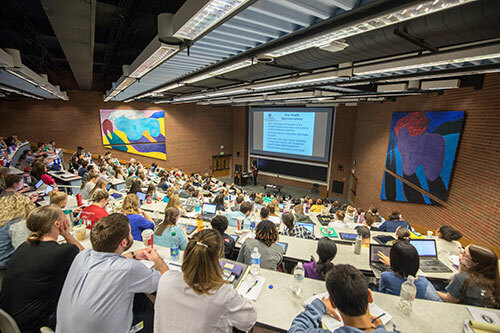 A packed crowd listens to the keynote lecture presented by Dr. Jonna Mazet titled, “One Health – A Prescription for Preparedness” in Lynn 1136. 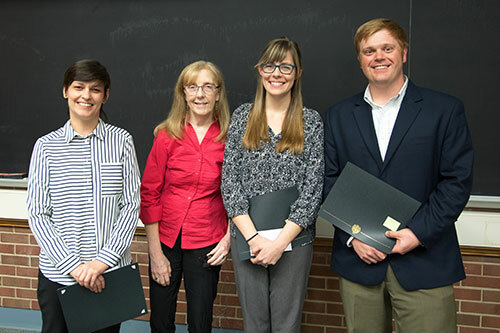 Professor of Ophthalmology Jean Stiles (center-left) is joined by Osborne Award winners (left — right): Andrea Pires dos Santos (3rd place), Lisbeth Ambrosius (2nd place) and Alec Davern (1st place). Omicron Chapter of Phi Zeta Secretary Tiffany Lyle (left) and President Christina Wilson (right) are joined by some of the PVM Research Day winners (left – right): Ahmed Hassan, Dr. Haroon Mohammad, Dr. Seika Hashimoto-Hill, Mary Jordan, Sydney Byerley and Dr. Saravana Kumar Kailasam Mani. Congratulations to the new PVM members of Phi Zeta! Some of the new members posed for a photo following the induction ceremony.